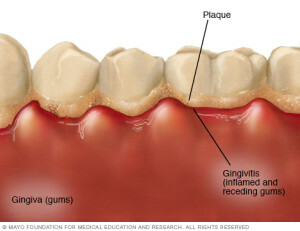 Gingivitis is the inflammation of the gums, related to periodontal disease. If gingivitis is left untreated it can cause major dental problems. A patient with gingivitis will have swollen red gums, that most likely bleed when they brush their teeth. The beginning stages of gingivitis are the most crucial, If the gingivitis is treated early with brushing and flossing there’s a chance that it doesn’t have a negative effect on your gums. If left untreated it can lead to periodontitis, and that will affect your bone and gums. Gingivitis is caused by plaque deposits that are on the teeth. Plaque is a sticky film that build up on your teeth that contain bacteria. The bacteria in the plaque causes tooth decay and gum disease. Plaque that is not removed turns into calculus and that irritates the gums, causing them to become infected, swell, and tender. Plaque isn’t the only thing that causes gingivitis, certain infections also cause gums to swell and become red. Poor oral hygiene, uncontrolled diabetes, and misaligned teeth can also raise the risk of gingivitis. The hormonal changes in pregnancy can also affect the gums. In your dental exam your dentist will look for the following conditions, bleeding gums, swelling, and pocked depth. The pocket depth is the space between the gums and tooth, the bigger the pocket the more severe is the periodontal disease. Caries and teeth alignment are also important conditions your dentist will look for. Gingivitis can be treated at home with brushing and flossing daily to remove any plaque that’s on the teeth. Professional teeth cleanings are also a way to treat gingivitis, correcting misaligned teeth, and using antibacterial rinses can help with gingivitis. This entry was posted in dentist, santa ana, smiles on bristol and tagged dentist in santa ana, Gingivitis, santa ana dentist on August 18, 2016 by Francisco Torres.